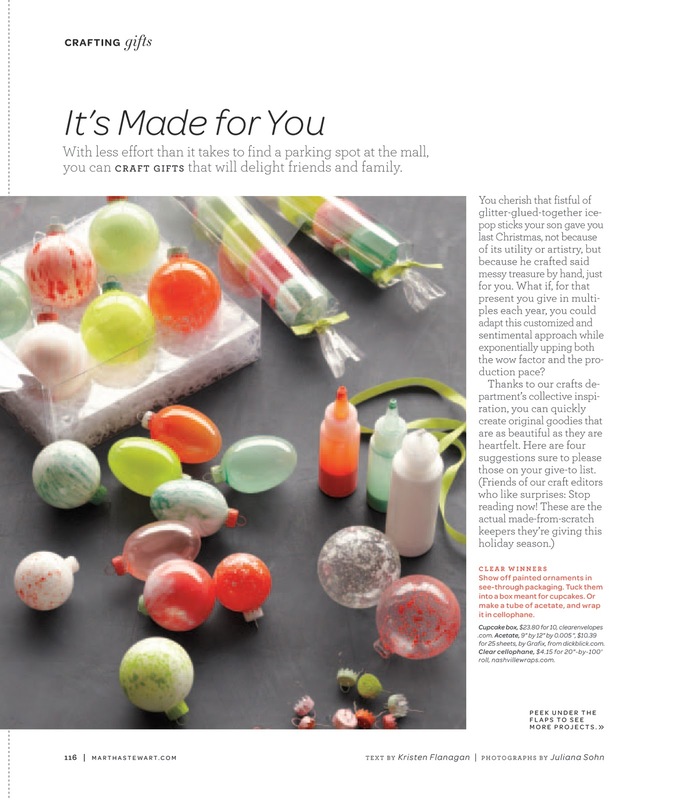 ClearBags' Cupcake Boxes (CBS175) are being featured in the December issue of Martha Stewart Living as a creative homemade gift idea. When you spend your time and money creating the perfect product, you want to ensure that you showcase your product in the best way possible. Here are 5 things to look for in choosing which boxes to use. 1. Strength –The key is obtaining a balance of thickness for strength and durability, without losing the flexibility needed for easy assembly. Our 12 mil Crystal Clear Boxes have superior strength and durability, while remaining flexible to make assembly quick and easy. For heavier or lighter boxes, we can custom manufacture to fit your needs. 2. Clarity – Clear packaging allows your product, and not the box, to be seen. Our Crystal Clear Boxes provide only the highest level of clarity. 3. Anti-Scratch Coating – All of our boxes are durable and scratch resistant. When extra protection is needed, try our Premium Clear Boxes. They have an additional coating for even greater protection from scratches and dents. 4. Materials – Material quality is essential. In an industry with many low quality options, ClearBags only uses the highest quality plastics in the construction of our boxes. You can see and feel the difference. 5. Folding/Construction – In order to make your job easier, our boxes store flat and are designed to allow you to assemble them in seconds. One final note: if you aren't finding the perfect size, please let us know. One of our Custom Products Sales Representatives will help you design the perfect box for you!